OPEN REEL ENSEMBLE hides an unusual group of 5 young musicians led by Ei Wada (who recruited 4 friends from university for his project) and its stand-out feature is its signature instrument: old rolls of magnetic tape that the group’s members connect to computers from the latest generation, creating unprecedented melodies, tones and sounds and providing a live show that defies any possible comparison with anything else you have ever seen on a stage. 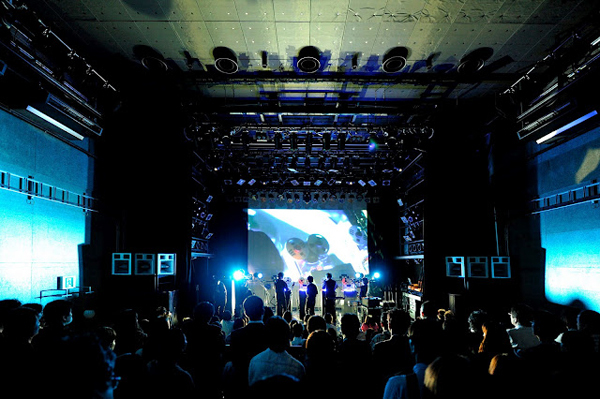 OPEN REEL ENSEMBLE was formed 2009 by Ei Wada and college fellows Kimitoshi Sato, Haruka Yoshida, Takumi Namba, and Masaru Yoshida (bass), Open Reel Ensemble combines old school, reel-to- reel (‘open reel’) tape deck and modern technology into a ‘musical instrument’. The group roots in leader Wada’s mid-teen days, when he obtained a reel-to-reel tape deck almost discarded from a radio station. After fooling around not knowing how to operate it, he, at one point, misperceived it as a ‘musical instrument’. By touching the reel and the exposed magnetic tape, he experienced the sense of ‘physically intervening in music and time’, and ‘playing the sound of the tape itself”. In 2008, Wada and Sato began developing a ‘reel-to-reel tape deck with USB ports’ by incorporating a computer in order to explore ‘the potential of a reel-to-reel tape deck as an instrument’. To manipulate a reel-to-reel tape deck as a ‘musical instrument’, a USB port was at- tached to enable the computer (and Max/MSP) to control. This allowed originally inca- pable performances, remote control, OSC interface, and sounds created by controlling the spin of the reel. In addition, they attached a sound oscillator that directly vibrates the tape. Convinced of a world of people jamming with this instrument, they envisioned this project as a band as well. They construct music as an ensemble by manipulating reel-to- reel tape decks with all their might and by using voices and sounds sampled on the spot, pursuing an alternative value of a forgotten media form, and attempting to explore the world of ‘convivial tools’. Wada uses several old electric instruments and computers to create multipe instru- ment performance arrangements. Besides using old open reel recorders as instrument to perform with Open Reel Ensemble he constructed the one-man performance in- stallation Braun Tube Jazz Band made of Braun Tube Monitors. His activities involve performances in Germany, Austria, France, Spain, Italy, Turkey, Korea and several other countries. I made a crash landing in 1987. Around the time I began to understand things, I came to believe that a music festival would be waiting at a place where there is a gigantic tower shaped like the leg of a crab with a tube television embedded in it. But at a certain moment, one of my friends pointed out that there was no such place on earth. So, in that case, I decided to make a virtue of necessity and to produce it myself. Every day and night since then, I have worked on bricolage. About ‘Open Reel Ensemble Project’ from mmmm on Vimeo.